Man listen, I absolutely love me some Pepper Tuna Steak. I could eat it every day if mercury poisoning wasn’t a thing. Since it is, I usually save this dish for special occasions or when I’m feeling fancy, as it’s pretty much the steak of the seafood world. Pan seared to perfection, crispy on the outside, and juicy within? Yasss, gimme that. 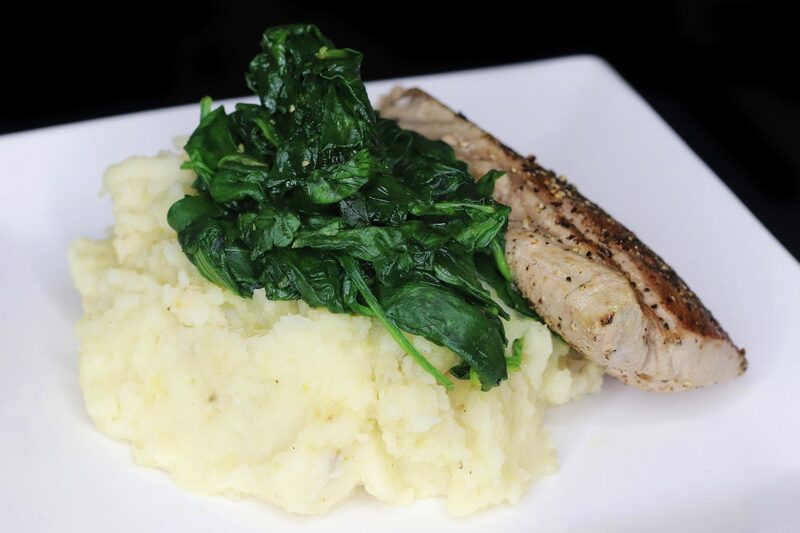 My favorite side dish to pair with Pepper Tuna Steak is Roasted Garlic Mashed Potatoes. Adding a little roasted garlic to homemade mash is life changing. Yes, it has to be homemade. The stuff in the box ain’t gone cut it. Besides, it’s so easy to make mashed potatoes from scratch that you have no reason not to. Finish off the meal with some fresh baby spinach, sauteed in a little olive oil. Seasoned with just a pinch of salt & pepper. This meal is extremely quick & easy, and perfect for unexpected dinner guests. 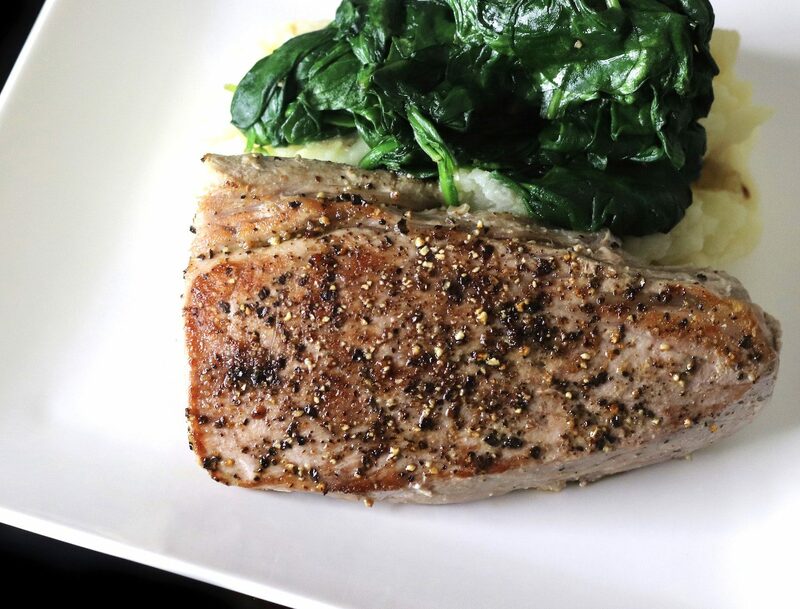 Frozen tuna steaks defrost pretty quickly in cold water. So I keep a bag in the freezer for when the mood arises. 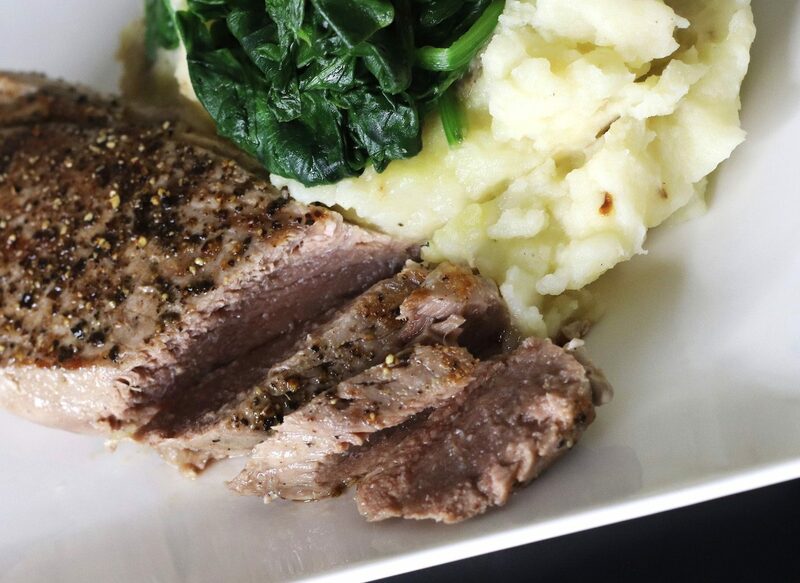 Pepper Tuna Steak pan seared to perfection, with homemade Roasted Garlic Mashed Potatoes. Thoroughly wash and peel the potatoes, leaving a strip of skin on each. Boil until tender, and drain in a colander. Put the potatoes back in the pot or in a large bowl. In a small saute pan, heat the olive oil and add the crushed garlic. Roast until slightly brown. Then add to the pot with the potatoes. Add butter, almond milk and salt & pepper to taste. Mash the potatoes with a potato masher (or a clean mug). To prepare the tuna, wash and pat dry with a paper towel. 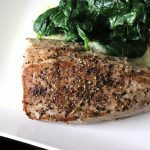 Rub the tuna steaks with a little olive oil, then season with a little sea salt, and a generous amount of black pepper on each side. It’s best to use freshly ground black pepper. If you have your own grinder, use the coarse setting. 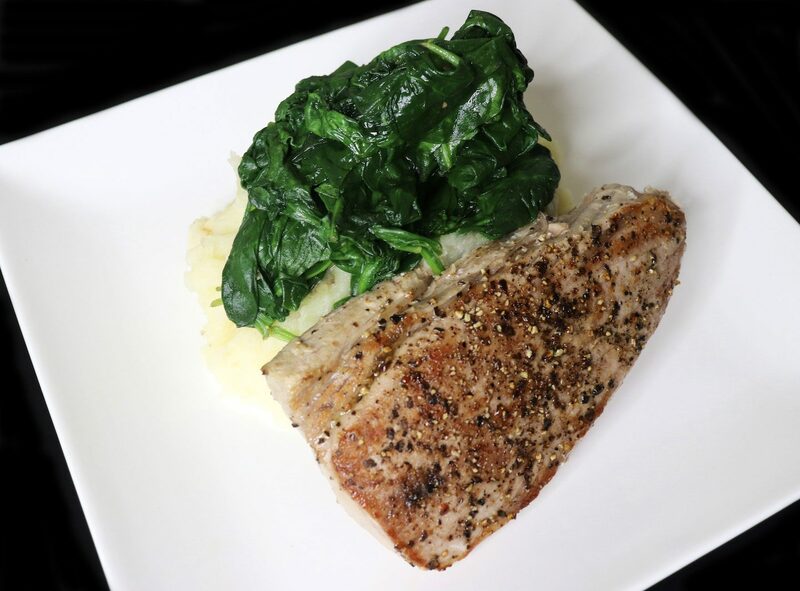 Serve Pepper Tuna Steaks and Rosted Garlic Mashed Potatoes with Sauteed Spinach or vegetable of your choice. * Timing depends on the thickness of your tuna steaks. The steaks should be medium rare when done. Be careful not to over cook.